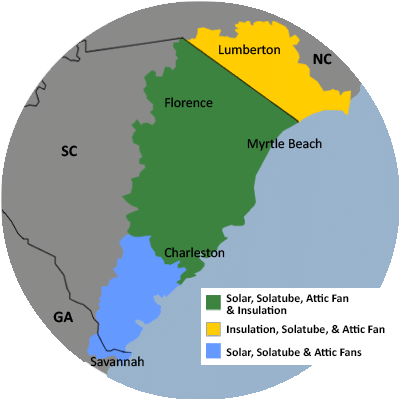 For a FREE no-obligation estimate in Georgetown County, SC, please fill out the form to the right and Carolina Energy Conservation will contact you shortly. 2 new construction projects and possibly a 3rd..
Moisture under the house. Dry and install moisture barrier with dehumidifier. We specialize in a variety of services aimed to lessen your home's carbon footprint and save energy and money each month! We offer it all, from air sealing to ductwork to insulation and HVAC services in Georgetown County, SC. For a FREE, no-obligation services estimate in Georgetown County, SC, you'll also receive a free copy of "Saving Energy and Money at Home," a great book to use as you begin to create a more comfortable, healthy, and energy efficient home! Michael had a lot of water in the crawl space beneath his home. He called Carolina Energy Conservation and one of our Comfort Specialists headed out to their home to inspect the crawl space. Our professionals found lots of mold due to moisture, and damaged insulation. We sent out one of our crews to install Thermax insulation around the crawl space, followed by a 20 mil vapor barrier. The crew used "Seam Weld" to seal the vapor barrier off from moisture and earthen air, and construction adhesive to seal the barrier against foundation walls and support pillars. Now, Michael doesn't have to worry about moisture and mold growth underneath his home! I would like a price for solar power on a house we are building in Georgetown. My biggest concern is that my house is hot! It's old and has no insulation.